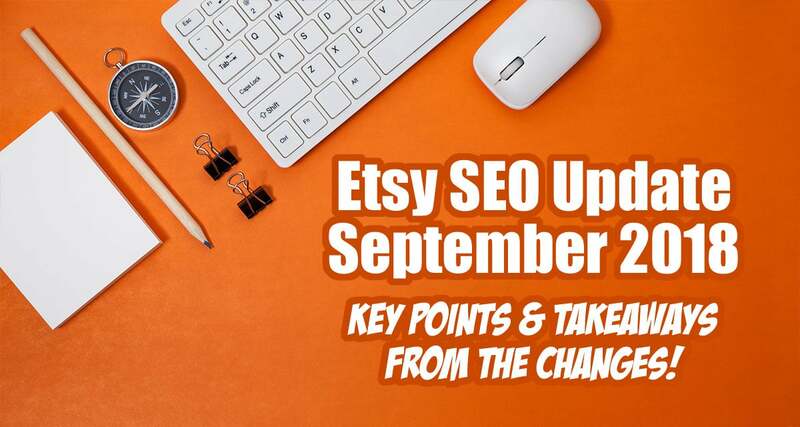 Etsy SEO Update September 2018 - Key Points and Takeaways From The Changes! 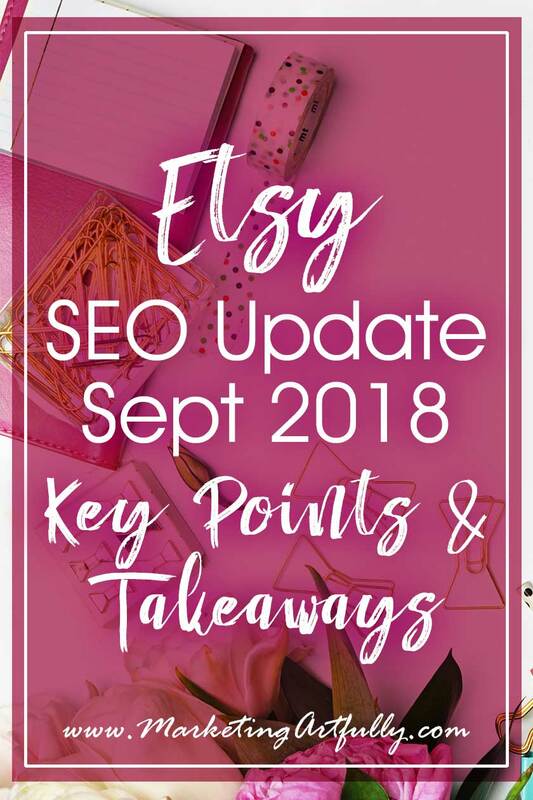 You are here: Home / Etsy Marketing / Etsy SEO Update September 2018 – Key Points and Takeaways From The Changes! Seeing as how so many of my products and suggestions for Etsy sellers center around Etsy SEO I have to stay on top of all their new “rules”. With that in mind, I thought I would do a quick post for you, telling you the top things that are popping out from the new guide they released today! 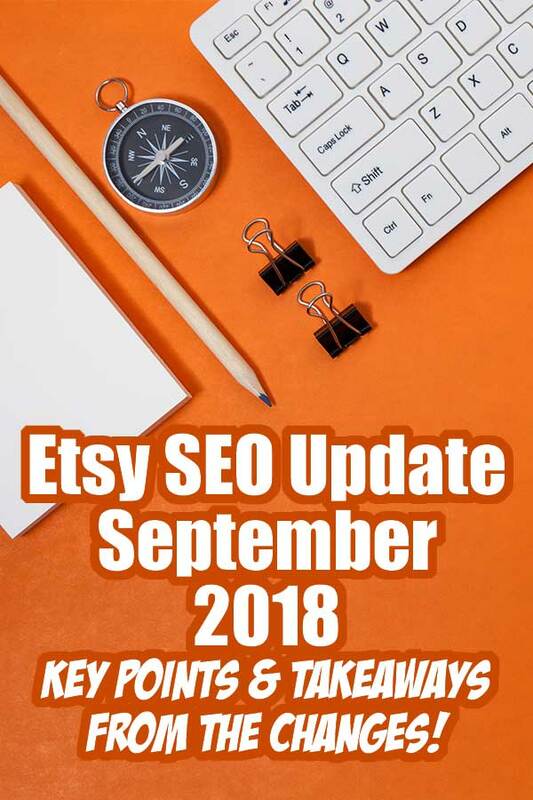 New Info From Etsy (September 19,2018)… How Etsy Search Works – Learn more about the different phases of Etsy search and the factors that go into search ranking. CSR helps us show shoppers relevant listings we believe they’re more likely to purchase based on what we’ve learned from shoppers’ habits across Etsy. What that means… search results shown are different for each buyer based on their history, much like Google’s search is! This means that buyers see products in different orders. This is based on a number of factors (see more below). We look at the titles, tags, categories, and attributes you’ve added to find matching keywords. Using all 13 tags, adding variety to your tags, adding all the relevant attribute options, and categorizing your items as specifically as you may all help increase the chance that your listings will match with a query. What that means… This matches what we have been seeing for a while! Repeating keywords in your title over an over (example .. Blue Necklace, Long Necklace) doesn’t increase your rankings. Instead you should say “blue long necklace”. Also you can use different keywords in your tags than you have in your title! UPDATE FROM ETSY… repeating a couple of key ones is a good idea, repeating them all over again is not necessary! Additional Resource :: Do You Need To Add Attributes and Categories To Your Titles and Tags For Etsy SEO? We look at how well a listing converts—how many people view it and then make a purchase—to determine whether buyers are interested in it. What this means… don’t use keywords that aren’t relevant even if they seem more popular! Also don’t put things like “Christmas” or “Valentines Day” in unless they really are specifically related to that holiday. Also all those “clicking groups” where you share your listing and others go and favorite it hurt your conversion rate because they are not actual buyers. When you return from vacation mode, you might not see the same traffic to your shop from search as before you went away. What this means… WOW! They are confirming that putting your shop on vacation DOES hurt you in rankings. Maybe instead of vacation mode, increase your delivery time to avoid this! You could say that you have a 10 day processing time if you will be out of touch for 7 days just to give yourself a buffer. Renewed listings get a similar, though smaller, boost. This temporary boost can last anywhere from a few hours to a few days. What this means… Renewing listings doesn’t make much difference in your search rank. This used to work in the past, but now for more than a little bit. Getting great reviews, having complete shop policies, and adding an About section positively impact your search ranking, while recent cases opened against your shop and intellectual property infringement issues can hurt your search ranking. What this means… fill out all the sections of your shop and be a good seller! The internet as a whole is super concerned with policies and I am sure that Etsy is no different. They make it really easy with a “standard” format if you don’t have anything weird! That second part is super important. I see A LOT of sellers who are using Copyrighted subjects in their shops (like Disney or Harry Potter) and hoping that they don’t get caught. Etsy has confirmed that getting caught DOES hurt SEO and if you continue to do it your shop might get shut down. Etsy search factors shipping price into search ranking to make it easier for shoppers to find listings with competitive shipping prices. Listings with lower shipping prices are more likely to rank higher in search. What this means… offering free shipping will help you get found in search more. Also reducing your shipping costs could help. We all know that there is no free shipping and prices are just raised to cover that cost! This is a personal decision for each shop owner (I don’t offer free shipping). Our Context Specific Ranking technology learns what buyers are interested to show them the items they’re most likely to purchase. What this means… You should use your stats to figure out what keywords you rank for! Just finding your listing on a SERP (search results page) doesn’t mean that anyone else sees it there. The only way to know that you are getting found for search terms is to see them listed in your keyword stats in your Etsy seller dashboard. Whew, that was a lot, but in my world not much has changed. Do good SEO research, use as many keywords as you can in your titles and tags and mind your stats!! !